Those who follow the saga of Seattle Seahawks running back Marshawn Lynch's media interviews know he is notoriously a man of few words. Whether it's answering every question with a laid-back "Yeah" or just thanking the press instead of uttering a real response, Lynch has unceremoniously been fined several times for his refusal to talk to journalists. However, not one but two brands—Skittles and Progressive—have now managed to get the tight-lipped athlete to talk. 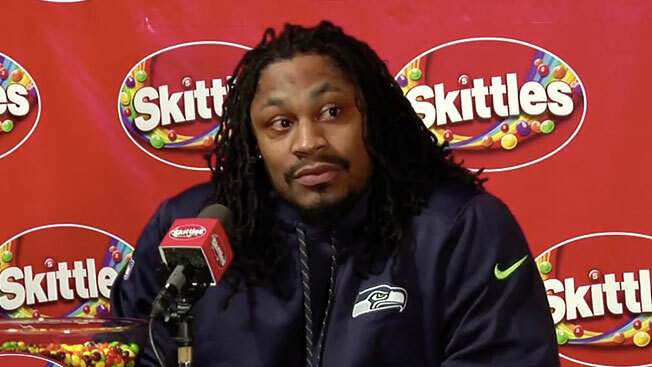 Skittles, a first-time Super Bowl advertiser, staged a mock press conference with Lynch as part of the teasers for its in-game ads. He answers questions like whether he prefers cat or dog videos, if he wishes he could rush for a 200-yard touchdown, and if he'd rather arrive to the game in a blimp or a jetpack. There's also handfuls of the candy available for Lynch to chomp down on, which is probably why he looks uncharacteristically joyful during the stunt. Separately, Lynch also sat down to chat with sports reporter Kenny Mayne for Progressive in the amusingly off-kilter video below. They mostly just play word association, although at one point Marshawn shares his love of Progressive's spokeswoman, purring, "I'm all about that Flo, boss." The Progressive campaign is also raising money for Lynch's charity, Fam 1st Family Foundation. The running back has signed a pair of cleats, which will be sold on eBay—with all proceeds benefiting the foundation. Please keep being you, Beast Mode.